The Windows Azure Pack Microsoft announced June 3 at its TechEd conference delivers Windows Azure technologies for you to run inside your own datacenter, enabling you to offer rich, self-service, multi-tenant services that are consistent with Windows Azure. As Microsoft explains in a free, downloadable white paper on Windows Azure Pack, the Windows Azure Pack is a superset of the previously named "Windows Azure Services for Windows Server" technology, which Microsoft announced back in July 2012, and which it made generally available in January 2013. Enterprises are learning from the widespread, organic adoption of self-service public cloud services, chosen over their in-house IT operations as business units prefer the agility and usage-based pricing of the public cloud. Enterprise IT departments are looking more and more to an internal service provider model as a means to get ‘back in the game’. The Windows Azure Pack for Windows Server provides a solution for enterprises looking to act as service providers to attract enterprise workloads. It runs on top of Windows Server and System Center and delivers Windows Azure technologies into your datacenter, enabling you to offer a rich, self-service, multi-tenant cloud with Windows Azure consistent experiences and services. The Windows Azure Pack is a collection of Windows Azure technologies, available to Microsoft customers at no additional cost for installation in enterprise and service provider datacenters, integrated with existing System Center and Windows Server environments. 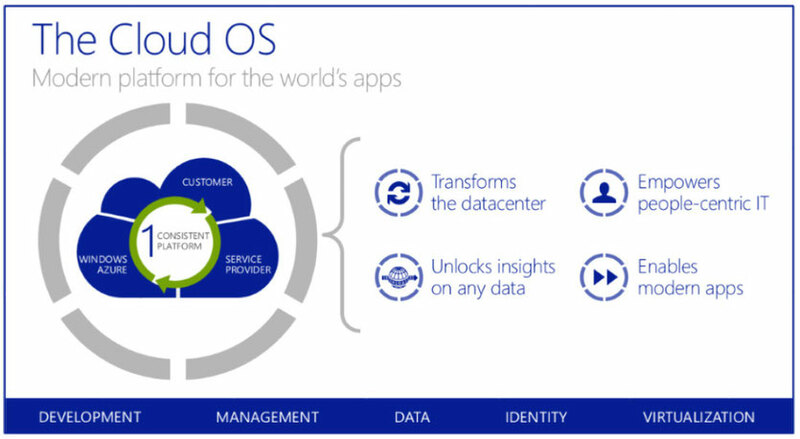 This Microsoft Cloud OS vision aims to provide customers with one consistent platform for infrastructure, applications and data - spanning customer datacenters, hosting service provider datacenters, and the Microsoft public cloud. Building on a familiar foundation of Windows Server and System Center it delivers an enterprise class cost-effective solution for multi-tenant cloud infrastructures services. Service Providers and enterprise customers can build customizable solutions using industry standard hardware, broad application platform support and open technologies. But how this could be related to SharePoint in any way? The Windows Azure Pack could be the missing part of the SharePoint 2013 apps puzzle, because it allows to host Azure-based apps in the customers own datacenter without any security and compliance issues possibly exist in the Azure cloud. And it could open Azure to host some next generation SharePoint XYZ version, completely build on Azure (my private thoughts only). More information about the Windows Azure Pack can be found here.